KHA is grateful for the support of its Quality Conference Sponsors! Through their generous donations, KHA is able to provide an outstanding annual Quality Conference. Please join KHA in thanking Quality Conference Partner Boehringer Ingelheim! Family owned since 1885, Boehringer Ingelheim is one of the pharmaceutical industry’s top 20 companies. Improving health and quality of life for patients is the goal of this research-driven pharmaceutical company. For more information, visit the Boehringer Ingelheim website at https://www.boehringer-ingelheim.com/. Midway University is hosting its 4th Annual Nursing Continuing Education Program and Alumni Luncheon on Thursday, May 2. Health Care Issues in Vulnerable Populations will feature topics such as human trafficking, intimate partner violence/domestic violence, homelessness and veterans. Speaker announcements are coming soon. Registration is available online at https://secure.qgiv.com/for/mncl2. Cost is $55 for RNs; $35 for Midway University Alumni; and $20 for Nursing Students/Midway Faculty. Five contact hours will be awarded. If you have questions, please contact Carrie Boling at Midway University (cboling@midway.edu or 859-846-5326). KHA is grateful for the support of its Quality Conference Sponsors! Through their generous donations, KHA is able to provide an outstanding annual Quality Conference. Please join KHA in thanking Quality Conference Partner Advanced Sterilization Products! Through its four business platforms, ASP supports health care facilities in the fight to protect patients against three primary sources of HAIs: medical devices, the environment and human contact. For more information, visit the Advanced Sterilization Products website at https://www.us.aspjj.com/. KHA is grateful for the support of its Quality Conference Sponsors! Through their generous donations, KHA is able to provide an outstanding annual Quality Conference. Please join KHA in thanking Quality Conference Reception Sponsor Care Logistics! Care Logistics helps hospitals improve operational efficiency and patient experience by efficiently managing patient progression and throughput. They drive sustainable improvements in efficiency and reliability, while positively impacting financial performance. For more information, visit the Care Logistics website at https://www.carelogistics.com/. The Kentucky Trustee is a quarterly newsletter KHA produces for the benefit of hospital boards. The goal is to provide your trustees with information they need to lead your hospital forward in today’s rapidly changing environment. The winter edition of the Kentucky Trustee is available at https://kyha.memberclicks.net/assets/docs/Publications/KT/KTWinter19.pdf. KHA mails the Kentucky Trustee newsletter to all trustees for which the Association has contact information. This is a good time to ensure KHA has your current board members’ addresses. If you have suggestions for future issues of the Kentucky Trustee, please contact Ginger Dreyer at KHA (502-426-6220 or 800-945-4542 or via e-mail at gdreyer@kyha.com). KHA is grateful for the support of its Quality Conference Sponsors! Through their generous donations, KHA is able to provide an outstanding annual Quality Conference. Please join KHA in thanking Quality Conference Partner Cepheid! Cepheid manufactures equipment to conduct rapid, accurate, molecular testing for over 21 tests. They can help with the diagnosis and treatment of HAI and infectious diseases. Cepheid’s on-demand testing can help with AMS programs in your hospital. For more information, visit the Cepheid website at http://www.cepheid.com/us/. Save the date for the Third Annual Kentucky Telehealth Summit on May 23. The Summit will be at the Knicely Conference Center at Western Kentucky University in Bowling Green. The Summit is presented by the Kentucky Office of Rural Health (https://ruralhealth.med.uky.edu/kentucky-office-rural-health). KHA is grateful for the support of its Quality Conference Sponsors! Through their generous donations, KHA is able to provide an outstanding annual Quality Conference. Please join KHA in thanking Quality Conference Partner Midway University! Midway University offers a daytime or accelerated evening ADN-RN program, online RN-BSN program, online MSN and MBA programs. In addition, Midway offers a Health Care Administration program. For more information, visit the Midway University website at https://www.midway.edu/. 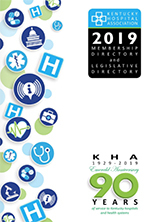 The digital edition of KHA's 2019 Membership Directory and Legislative Directory is available now. Visit www.kyha.com and click on Print Directory on the right side of the page to view. You can also follow this link to reach the Directory directly. Hospital executives will receive printed copies of the Directory shortly. Clicking on any of the following Table of Contents links will deliver you directly to that page of the Directory. The KHA Small, Rural and Critical Access Hospital (CAH) Forum will meet on March 4 at 2:00 p.m. (ET) via webinar/conference call. All small, rural and CAH CEOs, CFOs and COOs are invited to attend. If you have information you would like to present or share, or you need to obtain participation information, please contact Elizabeth Cobb at KHA (ecobb@kyha.com). KHA is grateful for the support of its Annual Sponsors! Through their generous donations, KHA is better able to support its members and provide a wide array of services. Please join KHA in thanking Bronze Sponsor Columbia HeartSource! Columbia HealthSource is a management services group at Columbia University Medical Center that specializes in helping hospitals build new cardiovascular care programs or enhance existing programs. Their services, delivered by clinical departments at Columbia University Medical Center, draw upon experts in virtually every field of cardiovascular medicine & cardiothoracic surgery. As you know, KHA has embarked on a journey to identify the next President and CEO for KHA. The initial step entailed engaging Witt/Kieffer, a national executive search firm to partner with the Association in conducting a thorough national search for KHA’s next leader. KHA is grateful for the support of its Annual Sponsors! Through their generous donations, KHA is better able to support its members and provide a wide array of services. Please join KHA in thanking Bronze Sponsor Robins & Morton! Founded in 1946, Robins & Morton is a privately held construction company that consistently ranks among the 100 largest builders in Engineering News-Record Magazine. For more information, visit the Robins & Morton website at http://www.robinsmorton.com/. KHA is grateful for the support of its Annual Sponsors! Through their generous donations, KHA is better able to support its members and provide a wide array of services. Please join KHA in thanking Silver Sponsor MCM CPAs! MCM CPAs and Advisors offers a full range of accounting, audit, tax planning and consulting services for businesses of all sizes, nonprofits and individuals. For more information, visit the MCM CPAs website at https://www.mcmcpa.com/. KHA is grateful for the support of its Annual Sponsors! Through their generous donations, KHA is better able to support its members and provide a wide array of services. Please join KHA in thanking Bronze Sponsor VALIC! Since 1955, VALIC haS been a top-tier retirement plan service provider within the health care marketplace and has managed Kentucky employer retirement plans for more than 40 years. They offer a high touch participant service model through on-site advisors, combined with award winning digital communications to motivate your employees! For more information, visit the VALIC website at https://www.valic.com/. KHA is grateful for the support of its Annual Sponsors! Through their generous donations, KHA is better able to support its members and provide a wide array of services. Please join KHA in thanking Corporate Sponsor Ideal Protein of America! The Ideal Protein Weight Loss Protocol is medically designed and developed, and is consistent with evidence-based guidelines, to help obese and overweight patients or clients achieve safe, long-term weight loss and maintain it. For more information, visit the Ideal Protein of America website at https://idealprotein.com/. You are invited to a webinar on February 13 at 1:00 p.m. (ET) to learn how to "Avoid the Common Pitfalls of Equipment Maintenance Management," an expense which is a top 10 hospital spend! KHA has partnered with Remi to provide your facility with an effective solution for managing your equipment maintenance contracts, saving you time and money. KHA is grateful for the support of its Annual Sponsors! Through their generous donations, KHA is better able to support its members and provide a wide array of services. Please join KHA in thanking Corporate Sponsor Mobile Heartbeat! Mobile Heartbeat enables clinical care teams to communicate and collaborate faster and more efficiently. Their platform transforms communications and streamlines work flows to improve patient care. For more information, visit the Mobile Heartbeat website at https://www.mobileheartbeat.com/. Kimber Booth was recently elected as a Kentucky representative to the American Society of Health-System Pharmacists (ASHP) House of Delegates. Her term will run through 2021. Boothe currently serves as chair of the KSHP House of Delegates and works as the System Director of Pharmacy for St. Elizabeth Healthcare. The AHA Annual Membership Meeting will be held April 7-10 in Washington, D.C. Leaders from health care, politics, public policy and the media will converge for the year's preeminent advocacy and public policy conference focused on the issues that matter most to hospitals and health systems, and the patients and communities they serve. Scheduled speakers include Colin Powell, retired four-star general and former Secretary of State; Chuck Todd, moderator of NBC's Meet the Press and political director for NBC News; and Jon Meacham, presidential historian and Pulitzer Prize-winning author. On January 29, KHA submitted comments to the Kentucky Department for Medicaid Services (DMS) in regards to how DMS should choose Medicaid managed care organizations (MCOs). The suggestions included requiring reviewing past performance, coding guidelines, a one-year time for claims filing and prohibiting MCOs from applying Medicare edits to outpatient claims. The Department should also require each MCO to provide EDI response to providers, provide better information on when preauthorization is needed (and limit changes to preauthorization requirements). In addition, DMS should create more prohibitions on what can be denied. To see all the recommendations KHA submitted, please visit the Policy page of the KHA website. You must log in to view this page. Your user name is your email address and your password can be reset via the website if needed. After receiving input from the KHA Hospital Reimbursement Committee, the Association submitted comments to the Office of Legislative and Regulatory Affairs regarding disproportionate share hospital (DSH) distributions. After KHA's collaboration with hospitals and the Department for Medicaid Services (DMS) to modernize the DSH payment program, KHA members subsequently identified concerns once they had an opportunity to review the Department's proposed changes to the regulation. Some changes simply need clarification while others are not in keeping with the prior agreement on how the DSH program will operate. KHA is conducting a comprehensive survey of current telehealth resource capacity and needs in Kentucky hospitals and other outpatient facilities. The KHA Strategic Planning Committee and Board of Trustees have enlisted KHA to conduct the study with the goal of understanding the current available resources in the commonwealth as well as the telehealth needs. KHA is grateful for the support of its Annual Sponsors! Through their generous donations, KHA is better able to support its members and provide a wide array of services. Please join KHA in thanking Bronze Sponsor PHI Air Medical, LLC! PHI Air Medical is the leading air ambulance provider across the country, providing air medical services and outreach education to local communities and leading health care systems. For more information, visit the PHI Air Medical website at http://www.phiairmedical.com/. The Department of Veterans Affairs recently announced the appointment of Stephen D. Black, PT, FACHE, as the new director of the Robley Rex VA Medical Center in Louisville. See their press release for more details. Register today for the third annual meeting of the Kentucky Pediatric Emergency Care Coalition (KPECC), a voluntary and collaborative effort to improve emergency medical care for children. Everyone, from children’s hospitals to community and critical access hospitals, along with other partners, is working together to improve the care children receive when it matters most. Join KPECC to raise the bar on pediatric readiness in the ED, to include pediatric metrics in QI programs, to increase capacity and disaster preparedness to address pediatric issues and ultimately to decrease morbidity and mortality for ill and injured children. All hospitals are invited to join the Kentucky Pediatric Emergency Care Coalition at its third annual meeting on March 6, at the KCTCS System Office in Versailles. KHA is now accepting applications for the Annual KHA Quality Awards. Please see the application for the full details. Applications are due on March 29. Awards will be presented at the KHA Annual Convention Awards Luncheon in May in Lexington. More details on the award and on past recipients are available in the Safety and Quality section of the KHA website, www.kyha.com. Kentucky Hospital Association’s research and education foundation (KHREF), in partnership with the Kentucky Office of Rural Health, is offering access to a FREE database of clinic practitioner compensation, benefits and performance data. This is a national database with 19 other states already participating. All hospitals with rural health clinics are invited to participate for free! POND will assist you in helping your clinic to recruit providers, ensure competitive compensation and benefits and establish meaningful performance targets. There will be a POND kick-off and demonstration webinar January 15 at 10:00 a.m (CT)/ 11:00 a.m. (ET). Online registration is available at https://www.surveymonkey.com/r/POND11519.